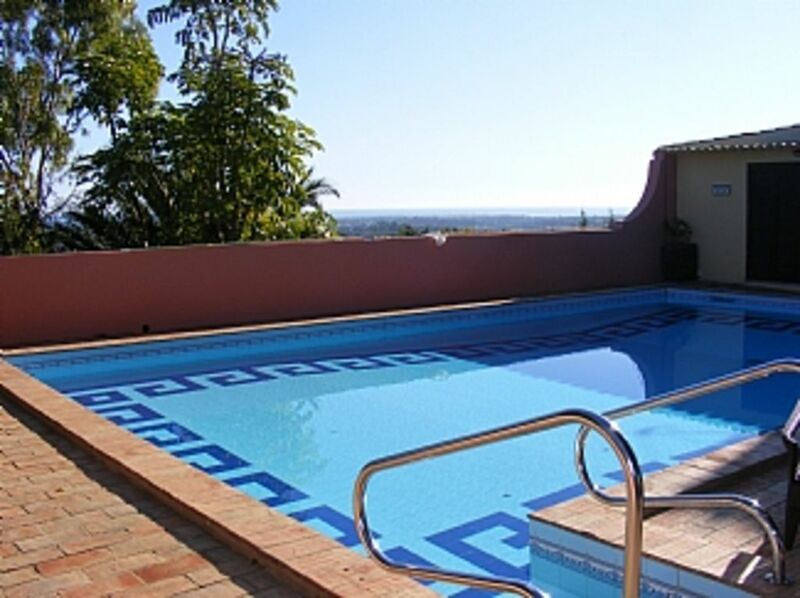 Cottage near Moncarapacho, Algarve - Stunning Panoramic Sea View, Pool + relaxation! Respite for couples in serious need of battery recharging. With a wonderful 6ft bed, ensuite, and amazing sea view. You have a 60 sq.m. pool, serious swimming, air conditioning, 4G WiFi, DVD and Bose CD. Relaxation is guaranteed in this self-contained haven. Nestling into the brow of a foothill of Sao Miguel, the eastern Algarve's highest peak, with breathtaking panoramic views of the sea (15 minutes distance), your cottage extends to private covered areas which include gas or charcoal barbecue, extra cooker and giant marble table. The views of the Atlantic and the mountains behind us are stunning, both from the cottage and around the swimming pool. The large mature gardens, with fig, lemon and orange trees and a lawn are yours to enjoy privately. My welcome pack is legendary amongst my guests, I am a Cordon Bleu cook and it is all home made. On your arrival you will have wine, beer, chicken, hummus, chicken liver pate, mayonnaise, freshly squeezed orange juice, or what ever else I decide to make. ***FROM THIS YEAR onwards there is the option if you want to bring friends or family to rent an extra king sized room with private bath and own entrance and terrace, this would be rented ONLY to you. Pls enquire directly to me for pricing. Because it is so private, it feels like you are renting a large villa. The swimming pool and terraces have amazing panoramic views of the sea and mountains. Relaxing is everything, however you want to do it. Quiet or loud, it is entirely down to you. New high speed 4G installed 2017. Open plan sitting room with large sofa, and open plan kitchen with 4G WI FI, Bose CD, DVD, TV, air conditioning and automatic heating (also gas heating for winter if needed). A Nespresso. Unfortunately no George Clooney. I am a Cordon Bleu cook (I cooked for rock stars) and provide a brilliant Welcome Pack for your fridge. Oven, hob, 2 fridges, one outside, dishwasher, microwave, food processor, juicer, it is a kitchen for cooks. Open plan, inside and out with your own barbecue and table area. Links to local Sea Sports Day trips. Links to local Sea Day trips from all of the beaches around us. You can take water taxis out around the islands and see the dolphins, which is lovely. Many of them looking out at the sea. One huge private terrace one for you only. Main pool terrace is pretty private, too. The nearest courts are nearby in Maragota. Villa Monte (9 hole)10 mins. Maragota (9 hole) 15 mins. Benamor 25 mins, Quinta da Ria 35 mins. Vale Do Lobo/Quinta Do Lago 30 mins. Vilamora 45 mins these are all 18 hole. All water sports from kite surfing, water skiing. Etc., You have small Islands off the coast, and you can either get ferries or the water taxi (which is very cheap) and even in August the Water Taxi will take you to deserted beaches. It is only me on the property in my own house and I rarely use the pool, and certainly not if my guests are in it, so it will be pretty private for you. This was our 5th visit to Joan’s wonderful villa and we have already booked for next year. The villa, the pool, the grounds and the all round views are second to none. If you want a relaxing chilled out holiday this is the place for you plus the weather is fantastic all year round. If you hire a car you can easy access the motorway which takes you to anywhere you want to go in the Algarve. Moncarapacho is a small village but it has everything you could want, restaurants, supermarket and plenty of shops. The lifestyle there is very laidback and relaxed, you can do as much or as little as you want. The beaches near by are absolutely gorgeous and we would recommend the ones in Villamoura and Quiteira. Restaurants we would recommend are Antonio’s in Moncarapacho, Lagar Mesquite in Sao bras and BJ’s near Quiteira. For us, Joan is absolutely brilliant, we have now become very close friends, she will help you with anything you want, directions , taxi hire and recommending restaurants and places you might like to visit, she is not intrusive at all but she is there if you need her. Our holiday would not be the same without her, we love Joan and her friends and dogs and cat .Joan wants you to have the best holiday you can and she will do whatever to make it so. For us it’s a little piece of paradise which delivers everything we need and look forward to many more holidays there. 7 minutes drive to Moncarapacho, where you have a local Market, and small supermarkets. 10 mins Estoi - Roman temple, C19th palace. Tavira 20mins, venetian atomsphere, Spanish border 30 mins. Olhao cubist town with fantastic fish and fruit market. Seville 1 hr 40 mins Lisbon 2-3hrs. Moncarapacho has everything a market town fish vegetable market, very good restaurants, small supermarkets open 7 days a week. Or you go down to 125 road and you have ALDI, LIDL. Sea fishing trips, bird and dolphin spotting and diving expeditions can all be arranged.Visit to the Ria Formosa park centre (many rare birds). IN FUSETA, you have water sport such as Kite Surfing, Boat Tours, Stand up Paddle, kayaking, Water skiing. Also,there is another Water Taxi, he has so much local information, and will take you to all the different Islands, off the coast. Or there is also ferries and water taxi in OLHAO, ALSO TAKING YOU TO ALL THE ISLANDS. TAVIRA is a beautiful town, and well worth exploring, reminds me of a faded Venice. The architecture is very unique. It is the unspoilt side of the Algarve, and is very Portuguese.